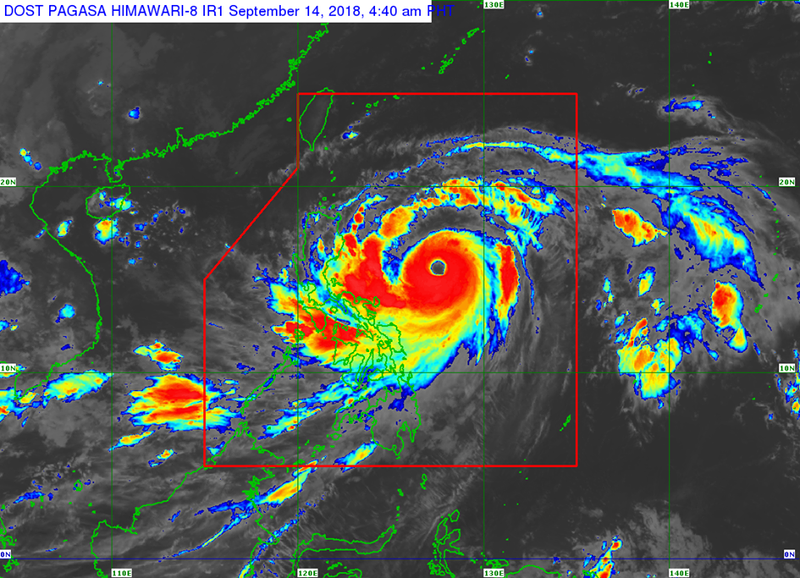 MANILA, Philippines – 'Bagyong Ompong' (international name: Mangkhut) still threatens Northern Luzon while maintaining its strength, state weather bureau PAGASA announced in its 5:00 am update on Friday, September 14, 2018. At 4:00 am today, the eye of Typhoon Ompong was located based on all available data at 655 km East of Infanta, Quezon (15.4 °N, 127.7 °E). 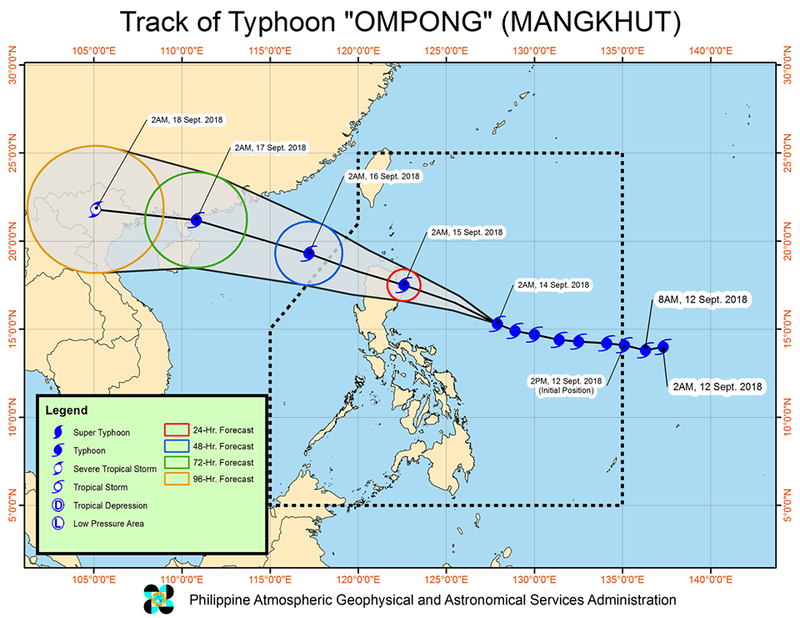 'Ompong' has maximum sustained winds of 205 kph near the center and gustiness of up to 255 kph. It is moving West Northwest 20kph. The strong typhoon is expected to make landfall in Cagayan-Isabela area on Saturday early morning (September 15). Tropical cyclone warning signal (TCWS) No. 3 (Winds of 121 -170 kph is expected in at least 18 hrs) is up over Isabela. Signal No. 2 (Winds of 61-120kph expected in 24 hrs) was raised over 17 areas of Batanes, Cagayan including Babuyan group of Islands, Ilocos Norte, Ilocos Sur, Apayao, Abra, Kalinga, Mountain Province, Ifugao, La Union, Benguet, Nueva Vizcaya, Quirino, Pangasinan, Nueva Ecija, Aurora and Tarlac. Meanwhile, Signal No. 1 (Winds of 30-60 km/h Expected in 36 hours) is up in 20 areas: Pampanga, Bataan, Zambales, Bulacan, Rizal, Metro Manila, Cavite, Batangas, Laguna, Quezon incl. Polillo Island, Northern Occidental Mindoro incl. Lubang Island, Northern Oriental Mindoro, Masbate, Marinduque, Camarines Norte, Camarines Sur, Catanduanes, Albay, Sorsogon, Burias and Ticao Island and Northern Samar. Occasional rains and gusty winds will be experienced over the areas under Signal No. 1. Stormy weather is expected over areas under Signal No. 2 and 3. The Southwest Monsoon (Habagat) enhanced by the typhoon will bring moderate to occasionally heavy rains over Visayas while scattered light to moderate to at times heavy rains over Palawan, Zamboanga Peninsula, Northern Mindanao and Caraga. Residents in these areas, especially those living near river channels, in low-lying areas and in mountainous areas, are advised to take appropriate actions against possible flooding and landslides, coordinate with local disaster risk reduction and management offices, and to continue monitoring for updates.